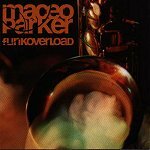 Well-known for his intense blend of funk and jazz piled on top of funk, Maceo Parker just keeps getting more youthful (in energy and spirit) with each coming year. With his hot saxophone as his weapon of choice, Parker is able to keep things smooth, while making you bump and groove to every note. FUNK OVERLOAD if a forty-eight minute dance through some of the hottest grooves you'll come across today in modern music. With sweat pouring out of his saxophone, and the rest of the band backing him up with some more flavor, he keeps things ultra-funky. When you listen to the music you know it's time to dance. "Uptown Up" shows the sheer magnitude at which he can play his instrument, while "Maceo's Groove" lets him get down and just through caution to the wind as he gets you to move your body with every bump and bounce that flows out of your speakers. Then there is the jazz-soul-funk of "Tell Me Something Good," which packs a silky chorus next to some funk-driven verses, which turns out to be quite the music to dance too. No matter what track you're listening to on this disc, Maceo always keeps things intense, steamy, and passionate. He doesn't allow time for error; all he wants to do is keep things hot while you put your body to the test and have some fun. I'll give this album an A.